Don't just memorize vocabulary wordsâ€”give your students the tools they need to understand and apply them! 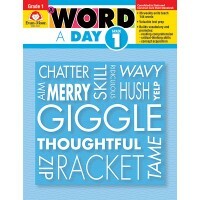 Help your students learn 144 new words with the focused daily practice in A Word a Day, Grade 1. Activities such as identifying attributes, making personal connections, choosing the right word in context, and answering true or false questions give students multiple exposures to the words, helping them develop the vocabulary they need to be successful on assessments and in the classroom. Don't have students just memorize vocabulary words ... give them the tools they need to understand and apply the words! Help your students learn 144 new words with the focused daily practice in A Word a Day, Grade 1. Activities such as identifying attributes, making personal connections, choosing the right word in context, and answering true or false questions give students multiple exposures to the words, helping them to develop the vocabulary they need to be successful on assessments and in the classroom. Examples of vocabulary words presented in Grade 1: * popular, thoughtful, appreciate * befuddle, pantomime, react * aim, discuss, explore * handy, giggle, jealous Help your grade 1 students develop the rich and diverse vocabulary they need for academic success! The 144 daily lessons in A Word a Day, Grade 1 use a variety of activities and approaches to provide students with a deep understanding of word meaning that goes past surface-level memorization. Grade 1, Reproducible Teacher's Edition, Make sure your students develop the rich vocabulary that's essential to successful reading comprehension and academic achievement with A Word a Day. 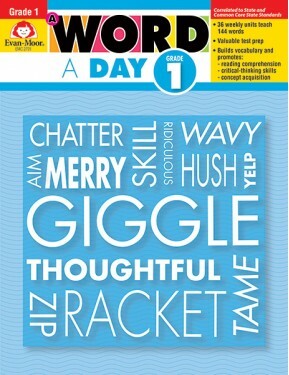 Each book in this newly revised series covers 144 words in 36 engaging weekly units.